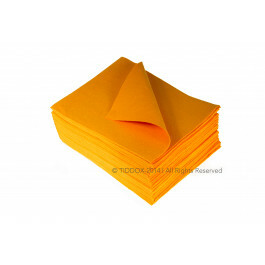 HEALTHCARE SPONGE CLOTH - "THE SUPERMAX"
Healthcare emergency spill clean up cloth - EXTRA LARGE, EXTRA ABSORBENT! The most absorbent healthcare wipes can make the care taker’s job so much easier. The hard-working people in the childcare and aged care industries often depend on disposable wipes for quick cleanups. But, sometimes, you just need a super absorbent towel that will keep a spill from spreading. The SuperMAX healthcare wipe is the best choice for those big messes. Whether you need to stop the spread of urine, blood, feces, or vomit, the powerful hydrophilic action of these healthcare towels will help contain the spill. They are soft enough to use on the patient’s skin for a quick wipe-down, but strong enough to drape on any surface and contain the liquid. Use it to pull liquids out of the carpet before it is cleaned. Or, keep one draped on the side of the bathtub to contain splashes from rambunctious toddlers getting a bath. In aged care, the SuperMAX will soak up spills so that you don’t lose your footing on a slick floor. Plus, they are affordable enough that you can throw them away if you need to! This healthcare wipe is tear resistant, strong and durable. As these cloths are supersized, customize your own SuperMAX cloth by cutting it into smaller pieces sections so that each of your care works has one in his or her pocket. Alternatively, check out TIDDOX HEALTHCARE MAXI WIPES , which are also manufactured from the same viscose absorbent fibres and available in a smaller 40cm x 38cm size, in a choice of colour coded formats (Red, Green, Blue, Yellow) . This colour coding of wipes is useful in aged care and childcare so that each colour is earmarked for a specific task or area, thereby preventing cross-contamination of germs between tasks and/or areas. Don’t you hate it when you sop up a mess and it drips all the way to the trash or sink? It certainly adds to the mess you have to clean. The SuperMAX towel will hold up to 8 times its own weight in fluid without dripping. Give it a try, and this will be the healthcare wipe you choose every time. Other related products from TIDDOX's healthcare range of cleaning cloths are the COLOUR CODED MAXI WIPES , the COLOUR CODED ANTIBACTERIAL WIPES-ON-A-ROLL , and the HEALTHCARE OMNIWIPES .